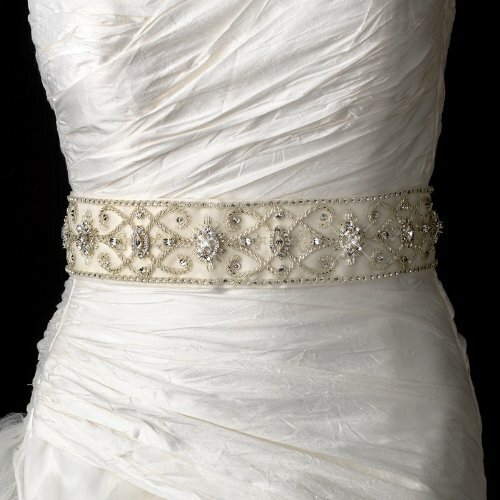 Vintage Beaded Wedding Sash Bridal Belt in White or Ivory by Elegant Bridal Shop at SCRHI. MPN: Carb-belt-13. Hurry! Limited time offer. Offer valid only while supplies last. Stunning Swarovski Crystal, rhinestone and bugle beaded royal bridal belt sash. Size: Design extends 33 1/2'' long by 2 1/3'' Wide on a 95'' ribbon. Stunning Swarovski Crystal, rhinestone and bugle beaded royal bridal belt sash. Size: Design extends 33 1/2" long by 2 1/3" Wide on a 95" ribbon. Available in White or Ivory, please email color preference. If you have any questions about this product by Elegant Bridal Shop, contact us by completing and submitting the form below. If you are looking for a specif part number, please include it with your message.